Dr. Fernando J. Ferrer has been working in peptide chemistry since 2001. Upon receiving his Ph.D. in 1999 from the University of Massachusetts under the supervision of Prof. L. A. Carpino, he accepted a position at The Burnham Institute in La Jolla, CA (now: Sanford Burnham Prebys Medical Discovery Institute). At The Burnham Institute, Dr. Ferrer ran a peptide facility in the Erkki Ruoslahti Laboratory for the synthesis of Arg-Gly-Asp (RGD) and tumor-homing peptides. Then in 2013, after some positions with different CMOs, Dr. Ferrer joined the laboratory of Prof Sir David Lane, also known as the p53 Laboratory, at the Agency for Science, Technology, and Research (A*STAR) in Singapore. 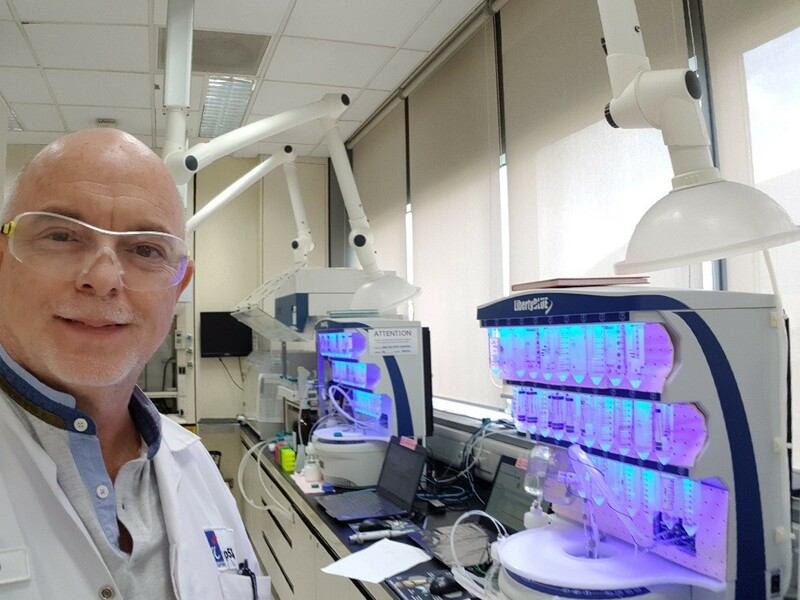 In the p53 Laboratory at A*STAR, Dr. Ferrer, in collaboration with Prof. Greg Verdine of Harvard University, works to develop and research the capabilities of stapled peptides in the p53 pathway. Their research is based on the MDM2–p53 interaction, and focuses on developing stapled peptides that are able to bind MDM2 and reactivate p53 functions. Importantly, p53 functions to prevent genome mutations and cancer/tumor formation. Figure 1. Dr. Fernando Ferrer with two Liberty Blues in the p53 Laboratory. In 2015, the p53 Laboratory acquired their first CEM Liberty Blue automated microwave peptide synthesizer, and in 2018 the group acquired their second unit (Figure 1). Dr. Ferrer and the p53 Laboratory have successfully utilized their Liberty Blues for the microwave-assisted synthesis of their benchmark peptides, including the synthesis of stapled peptide VIP116 (Figure 2). Figure 2. i, i+7 Ring closing metathesis for VIP116 peptide. The Liberty Blue has proved an effective instrument for the group. In a double blind study comparing the biological activity of VIP116 synthesized with conventional methods versus with the Liberty Blue, no difference was found (Figure 3). Figure 3. Double blind test. P53 activation assay – Comparing different methods of synthesis on T22 Cells.